I am a BACP and COSCA Accredited Counsellor and I have been practicing since 1992 - working for agencies, companies and in private practice. I have trained in a number of approaches with an emphasis on the person centred style of working. My particular interests include eating disorders, bereavement, stress and working with couples and adults with learning difficulties. 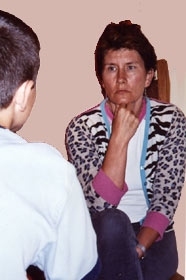 Counselling is a unique opportunity to be empathetically heard by a skilled and trained counsellor.In a confidential and trusting relationship and in a safe environment the time is exclusively yours to share what you choose when you are ready. I believe that counselling is an opportunity to share with someone who cares but without the emotional investment of a member of your family or friend.It is your decision as to the concerns or issues that you share. These may be worries about relationships, work, family money... You may be aware of the unsatisfactory or damaging ways you have of coping. If it is an issue for you then it is relevant and appropriate. Confidence and self-esteem may increase. Nothing is definite – you are worth a try! Contact me and we agree a date for an initial meeting. The frequency and number of sessions will be influenced by your needs. Sessions are a "50 minute" hour. Is it always One to One? No, I also work with couples, families and groups who may require a facilitator.